Franz Schubert's Trois marches militaires (“Three Military Marches”) are among the many works for piano four-hands that the composer produced during his lifetime. The three pieces, all in ternary (ABA) form, with a central trio leading to a reprise of the main march, were published in Vienna in 1826. The first of these three marches is far more famous than the others; in fact, it is one of Schubert's most famous compositions, and it is often simply referred to as “Schubert's Marche militaire”. 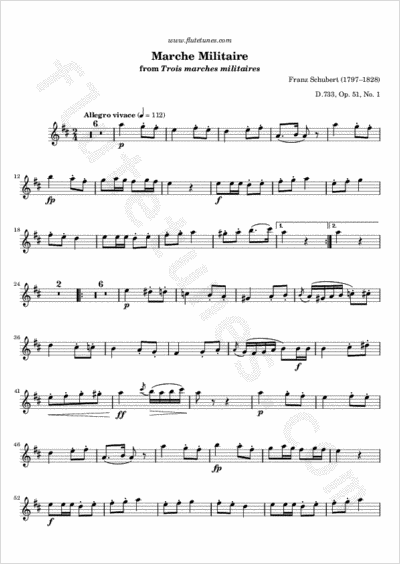 The piece is marked “Allegro vivace”, and is cast in the key of D major. An unharmonized fanfare begins the affair, paving the way for a lively, pompous main theme. There have been numerous arrangements of this march, and even Liszt wrote a masterful paraphrase of it (the Grand paraphrase de concert for solo piano); perhaps less flattering to its original conception is its appearance in Stravinsky's Circus Polka, a ballet... for elephants!